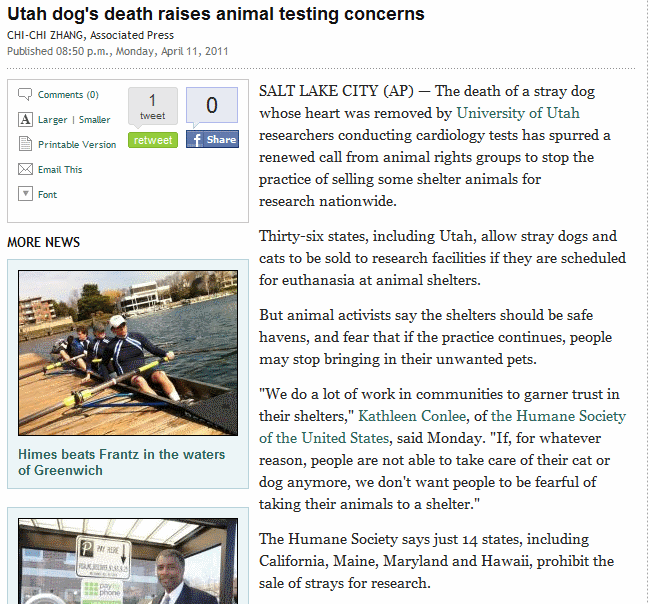 Here is an article that talks about the use of shelter animals as testing animals. We all know that without the use of animals we wouldn’t have a vast number of medical surgeries available to us now. But when it comes to our pets being used as test subjects things change. Especially when our pet is microchiped. This article talks about an adopted dog that later got lost and was sold to the University of Utah as a test subject for students learning how to do heart bypass surgery. But the shelter who picked up the dog never contacted the name on microchip. Because of this the university will now by test animals from specialized breeders. Yep, you read that right. These breeders make $1,000 for every cat and $2,000 for every dog! Our shelters are packed and we have breeders making a killing on selling dogs to laboratories. I don’t like the idea of shelter animals being used for testing, but if the shelter is going to euthanize the animal anyway it makes sense that it would serve a purpose and make it so that our doctors can save our lives. To me, the bigger crime here is people breeding animals to be test subjects! At least the shelter animals have a chance at life. What do you think? What would be a better solution?